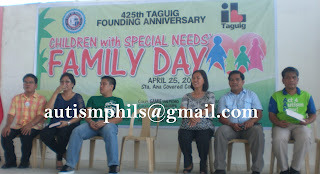 Last April 25, 2012 the City of Taguig celebrated its 425th Founding Anniversary. Part of the celebration is a Family Day for children as well as adults with disabilities facilitated by no less the Hon. Ma. Laarni Cayetano, the mayor of the city. “The founding anniversary of our city would not be complete without giving a day for our beloved persons with disabilities” mentioned Cayetano in her speech. But aside from giving of gifts, food and games for these special people, Mayor Cayetano through her City Social Welfare and Development Office and the Persons with Disability Office invited ASP Executive Director Ranil Sorongon and ASP Trainer My Sorongon to provide valuable information for parents of children with autism, persons with disabilities and other personnel of the city. Director Sorongon gave a lecture on “Republic Act 9442” emphasizing the 20% discounts of persons with disabilities, what are the requirements to avail the discounts, how to avail of the discounts and what to do if business establishments won’t honor the discount? Teacher My Sorongon on the other hand gave a lecture on “Understanding Autism and Its Impact on the Family” focusing on the behavioral manifestations of autism, the issues and concerns brought about by autism in the family and the programs and services of ASP to support families affected with autism. Even with the hot summer season, the more than 400 participants in the covered court of Brgy. Sta. Ana were so attentive and thankful of the new knowledge shared by the representatives of ASP. It was their first time to hear such speakers which were so engaging with beautiful power point presentations. The speakers also met some parents of children with autism who joined Angels Walk for Autism last January 2012 at SM Mall of Asia in Pasay City. Mayor Cayetano was so elated to have such seminar for her constituents. She instructed Mr. Larry Supaz, her PDAO head to fast track the planned implementation of the “Early Detection and Early Intervention on Autism Project” for the Day Care Teachers, Barangay Health Workers and parents of children with autism of Taguig City in partnership with ASP. We are sure that the said event was just a beginning of the partnership between ASP and Taguig City to make the Rights Real of Persons with Autism. For those who want to request for an Early Detection and Early Intervention on Autism seminar, kindly contact the ASP National Office at (02) 926-6941 or (02) 929-8447 or email at autismphils@gmail.com.